The Queued Message Handler (QMH) template facilitates multiple sections of code running in parallel and sending data between them. Each section of code represents a task, such as acquiring data, and is designed similarly to a state machine. Because of this design, you can divide each task into states. The QMH template is a version of the Producer/Consumer design pattern, where the user interface (producer) produces messages and the tasks (consumers) consume them. However, in the QMH template, you also can produce messages from a consumer loop. This template includes one producer loop and one consumer loop. You can add consumer loops as needed. Refer to the Continuous Measurement and Logging sample project, available from the Create Project dialog box, for an example of adapting this template to a measurement application. See a developer walkthrough of the Queued Message Handler template. The QMH template provides a starting point for writing this kind of application. A user interacts with the front panel, causing the Event structure in the Event Handling Loop (EHL) to produce a message. 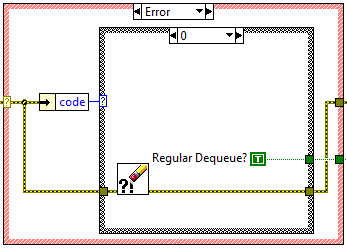 LabVIEW stores the message in a queue. The Message Handling Loop (MHL) reads a message from the message queue, removing the message. The message is a string that matches one of the subdiagrams of the Case structure in the MHL. Therefore, reading the message causes the corresponding subdiagram of the Case structure to execute. This subdiagram is called a message diagram because it corresponds to a message. Optionally, the message diagram produces another message, storing it in the message queue. The EHL is the producer loop. The MHL is the consumer loop. These loops run in parallel and are connected by the message queue, which facilitates communication between the loops. The message queue is a LabVIEW queue that stores messages for consumption. Because the EHL sends messages to this queue and not directly to the MHL, the EHL can produce messages while the MHL is not consuming them. Each message queue belongs to a single MHL. Every iteration of the MHL reads the oldest message in the message queue and then executes the corresponding message diagram. Although the MHL primarily consumes messages, it also can produce them. Your application can have multiple MHLs. Each MHL corresponds to a task the application performs, such as acquiring or logging data. Notice the UI Data cluster in the above diagram. This cluster is data that each message diagram in an MHL can access and modify. In this template, the cluster is defined as a typedef, UI Data.ctl. Each typedef belongs to a single MHL. In the Project Explorer window, open and run Main.vi. Click the front panel controls and watch the Display indicator display messages. You need to determine how many MHLs to add. Each MHL defines a task that executes in parallel with other tasks. You have an application that acquires data and, in parallel, logs this data to disk. For each MHL, you need to determine what message diagrams to add. A message diagram is a subdiagram of the Case structure in an MHL. Each subdiagram corresponds to a state the task can be in; therefore, to determine the message diagrams to add, separate each task into states. You want to separate the data acquisition task into three states: Initialize, Acquire Data, and Exit. Therefore, create these message diagrams in the MHL that acquires data. You need to determine when to execute each message diagram. A message diagram executes after its MHL receives the appropriate message. Therefore, you need to determine when to send each message to the MHL. You can send a message from a front panel control or from a message diagram. You want to add a button that sends the Initialize message to the data acquisition MHL. You then want the Initialize message diagram to send the Acquire Data message to the same MHL. Adding a Control that Sends a Message to a Message Handling Loop or Sending a Message to a Message Handling Loop, depending on whether you want a control to send the message. In the Project Explorer window, open Message Queue.lvlib:Create All Message Queues.vi. LabVIEW launches the Control Editor window. Expand the border of the Message Queues cluster. Duplicate the UI queue refnum in the cluster. Select File»Apply Changes and close the Control Editor window. The Message Queues typedef now contains an additional message queue. (Optional) If the MHL needs access to data, create a typedef that represents this data. Recall that in step 2, you bundled the New Task queue refnum into the Message Queues out cluster. The code above shows where this cluster is unbundled and how the wire branch for the New Task queue goes to the New Task MHL. Recall that in step 2, you had the option to send an initial message to the message queue. The code in step 2 shows the initial message Initialize. The code above shows the message diagram (Initialize) that executes when this message is received. Recall that in step 4, you had the option to create a typedef. The code above shows how you wire this typedef, New Task Data, so the MHL can use it. If you want the new task to send messages to the UI queue, branch the wire for the UI queue refnum into the New Task loop. Shutdown code runs only right before the MHL shuts down. Shutdown code always runs to completion. To keep the block diagram of Main.vi compact and readable, you can encapsulate each MHL into a subVI. To further organize the project, you can put each subVI, any supporting VIs, and its data typedef into a project library. Refer to the Continuous Measurement and Logging sample project, available from the Create Project dialog box, for an example of this design. The MHL shown above does not need access to the Stop Event wire. The MHL in the template uses this wire to execute the Fire User Event - Stop VI, which shuts down the Event Handling Loop. No other MHL needs to do this. A message diagram that initializes the task; for example, this diagram could connect to a hardware device, open files for data logging, and so on. A message diagram that handles unrecognized messages. By default, the message that triggers this message diagram is Exit, but you can change this. (Optional) If the application requires that the MHL stop performing its task but stay active (to potentially restart the task), create a message diagram that uses the Flush Queue function to remove any pending messages. For example, in a continuous measurement application, you may have Start Measurement and Stop Measurement buttons. Clicking Start Measurement initiates the MHL, which continues execution by sending itself the same message continually. In this application, clicking Stop Measurement should not only stop the measurement but also flush the message queue without stopping the MHL. If you do not flush the message queue, clicking Stop Measurement will have no effect. The message queue contains more messages to continue the measurement, and each of these messages causes another message of its kind to be produced. Send messages to the MHL. A message diagram is the subdiagram of a Case structure, located in a Message Handling Loop, that handles a particular message. It is similar to a state in a state machine. A message diagram is a subdiagram of a Case structure that is labeled with a string. It executes when the MHL receives a message that matches this label. In the MHL that represents the task, add a subdiagram to the Case structure. Tip If you are adding a message diagram to the MHL included in the template, you can automatically include the data and error wires in the new message diagram by duplicating the ---Copy This Frame--- case. To ensure that you track all errors, use the Merge Errors function to merge errors coming from all nodes in the subdiagram. To send a message to a message queue, use the Enqueue Message VI. To execute the message diagram, send a message to the MHL. The message you send must match the label of the message diagram that you entered in step 2. 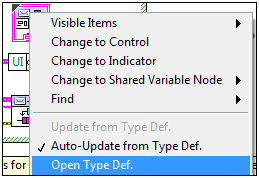 Modify this typedef according the needs of your application. For example, if more than one message diagram in an MHL needs to modify the same Boolean control, add a Boolean control to this typdef. If you have more than one MHL, create a typedef for each one. This design prevents errors by ensuring one MHL cannot access the data of another. Add a control to the front panel. (Optional) If you want a message diagram to programmatically modify this control, bundle the control refnum into the typedef for that MHL. Add an Event case to the Event structure in the Event Handling Loop. Click OK. LabVIEW creates an event case in the Event structure. Associate the terminal with the event by dragging the block diagram terminal for the new control inside this event case. Add code to this event case that sends a message to an MHL. Messages are strings that instruct an MHL to execute one of its message diagrams. Messages are produced by the EHL and are stored in the message queue. Every iteration of the MHL reads the oldest message in the message queue and executes the corresponding message diagram. Decide what part of the application will send the message and which MHL will receive the message. You can send messages from the EHL or from a message diagram. Decide what message diagram will execute when the MHL receives this message. Ensure the message diagram exists and has the same name as the message you want to send. If the message diagram does not exist, create it. Expand this Unbundle by Name function to access the wires of message queues for all MHLs. In the code above, Message is the text that matches the message diagram you identified in step 2, and the message queue refnum is the wire you identified in step 3. Note Access the Enqueue Message VI from the Project Explorer window of the template or by using Quick Drop. High-priority messages are typically reserved for emergency stop situations. These messages are placed at the front of the message queue, guaranteeing that the receiving MHL will consume that message next. LabVIEW displays a coercion dot on the input terminal because the data type of this terminal is variant. If you want your MHLs to shut down on a message other than Exit, change the message in this VI. Ensure all Case structures in an MHL have a Default message diagram. The code in this message diagram executes when the MHL reads a message that does not have a corresponding message diagram. Having a Default message diagram is important because messages are strings that you enter while programming, not values you select from an enum. In the Project Explorer window, open Message Queue.lvlib:Dequeue Message.vi and display the block diagram. To ignore errors when reading from the message queue, add error codes to the case selector label of the nested Case structure. The errors to ignore depend your application. For example, if you are reading the queue over a network, you might want to ignore timeout errors. To enable an MHL to modify a control programmatically, create a refnum for the control and bundle it into the typedef that stores data for that MHL. The following procedure uses UI Data.ctl as an example. Create the control refnum and move it into the Initialize subdiagram of the MHL. Open UI Data.ctl and add space for the refnum to the cluster. © 2012 National Instruments. All rights reserved. LabVIEW, National Instruments, NI, ni.com, the National Instruments corporate logo, and the Eagle logo are trademarks of National Instruments Corporation. Refer to the Trademark Information at ni.com/trademarks for other National Instruments trademarks.